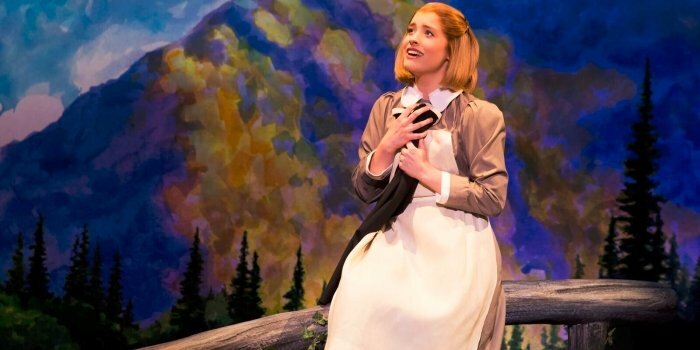 The touring production of The Sound of Music, currently on stage at Vancouver’s QE Theatre, may very well become one of your favourite things. Perhaps best known for the film adaptation starring Julie Andrews, audiences may be surprised to know this Rodgers and Hammerstein musical first saw life as a stage musical. Opening on Broadway in 1959, it would be six years later before the hills came alive in all its Technicolor glory. But while The Sound of Music may have originally entered our collective cultural conscious on the silver screen, the stage version, in this production at least, is just as beautiful and heartwarming. Based on Maria von Trapp’s memoir, The Story of the Trapp Family Singers, the musical does take some liberties with the real-life story, although its central themes and story remain intact. Finding herself at odds with her desire to become a nun and a free-spirit, Maria Rainer is sent to become governess to Captain Georg von Trapp’s seven children. Thanks to her love of music, Maria quickly becomes a favourite in a long string of governesses. 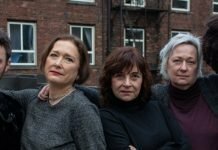 Finding herself falling in love with the children and their stern father, she brings life back to a household where music had once been banished. On the eve of the Anschluss in 1938, the von Trapp’s eventually hatch a plan to escape the Nazis rather than submit to the Third Reich’s rule. It is no coincidence it is music which will help in their flight. And what glorious music it is, with many of its songs now standards. They are all here: “Do-Re-Mi”, “My Favourite Things”, “Climb Ev’ry Mountain” and of course, the title song. As musicals go, this one is laden with so many instantly recognizable songs. In the stage version, there are also a couple of songs which were cut from the film version. And even though it isn’t hard to see why they may have ended up on the cutting room floor for the film version, they do help to round out the story. 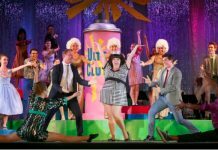 With music at its forefront, the imperative is for a cast who can do justice to Rodger’s music and Hammerstein’s lyrics. This cast is up to the challenge. As Maria, Jill-Christine Wiley is simply superb. In a joyful musical performance, there is no artifice, no embellishment. Her voice is as true as the words she sings. Wiley also brings a playfulness to the role, which is sublime. Jill-Christine Wiley as Maria Rainer in The Sound of Music. Photo by Matthew Murphy. 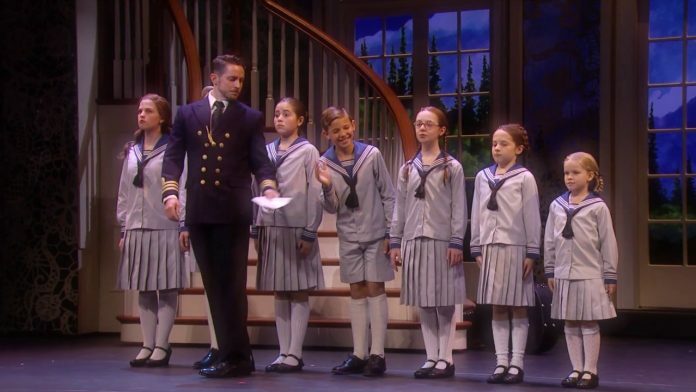 Mike McLean makes for a dashing Captain von Trapp, with a voice to match. His transformation is so heartfelt it is difficult not to shed a tear as he realizes he is losing his family, and his love for Maria will have you believing in love-at-first-sight. Then, of course there are the children. All seven – Keslie Ward, Landon Brimacombe, Arick Brooks, Katie Grgecic, Madeleine Guilbot, Maya Carp, and Amaryllis C Miller – are a delight. And boy can they sing. With wonderful harmonies in their ensemble numbers, the stage reinvention of “So Long, Farewell” is a highlight. Jake Mills brings the necessary comic relief as Max Detweiler, and Melissa McKamie is fantastic as Elsa Schraeder, the counterpoint to the Captain’s fight against the Nazis. Even as Lauren Kidwell plays to the back-of-the-house at times, she finds the right balance as The Mother Abbess, with a magnificently memorable, “Climb Ev’ry Mountain”. Under the recreated direction of Matt Lenz, based on original direction by Jack O’Brien, this is a straight-forward telling of this familiar story. Allowing the music and story to speak for itself, the overall effect is an understated elegance. Refusing to gloss over the politics of the time, Lenz ensures the darker side to this sometimes frothy show is not lost. Not everything is picturesque snow capped mountains in the Austrian Alps though. With ticket prices commanding top dollar, there is an expectation of perfection. On opening night, several dropped microphones meant some dialogue was lost. And while a touring show is fraught with issues as they must adapt to different venues, some sightlines in the QE Theatre were problematic. Consider it an early Christmas gift for the entire family. The Sound of Music with music by Richard Rodgers, lyrics by Oscar Hammerstein, and book by Howard Lindsay and Russel Crouse. Suggested by The Trapp Family Singers by Maria August Trapp. A Networks Presentations production of a Broadway Across Canada presentation. On stage at the Queen Elizabeth Theatre in Vancouver until September 17. Visit http://broadwayacrosscanada.ca for tickets and information.